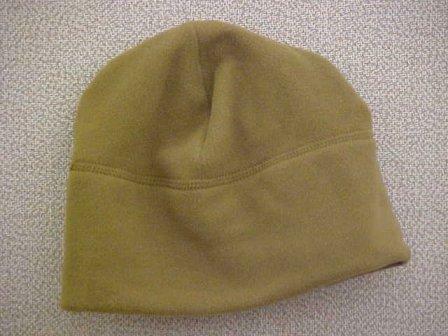 The basic material for the cap is a 100% polyester circular knit terry with comfort stretch, double-sided, low micro velour (fleece) with moisture management properties, no-pill Polartec 100 Series Micro Style 9118M pile or equal. The microfleece cap is a single ply construction in a bell shape, pull-on style with a crown shaped of four equal sections joined together by darts of equal length and with a 4 + 1/8 inch wide hem that can be cuffed or worn down. 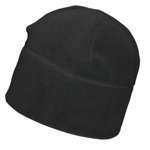 This design provides a cap that is light in weight, low in bulk, has environmental protection, and compatible with the helmet and ECWCS parka hood.